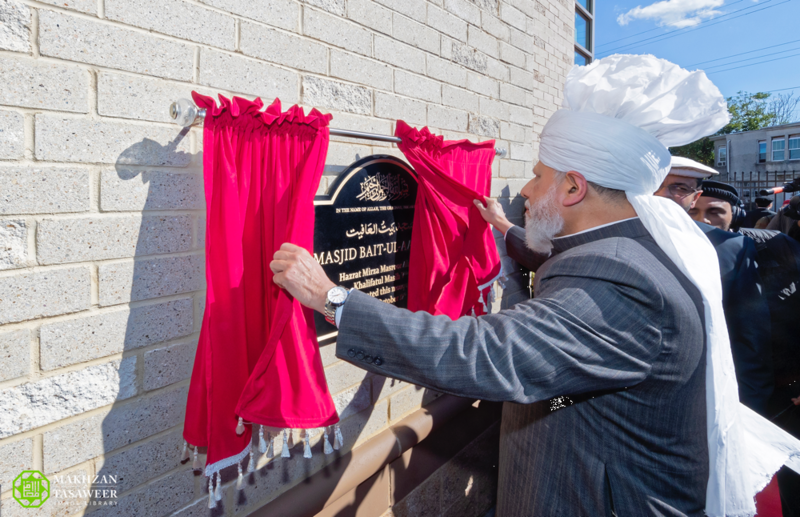 The Ahmadiyya Muslim Community is pleased to announce that on 19 October 2018 the World Head of the Ahmadiyya Muslim Community, the Fifth Khalifa, His Holiness, Hazrat Mirza Masroor Ahmad inaugurated the Baitul Aafiyat Mosque in Philadelphia, USA. His Holiness delivered his weekly Friday Sermon from the Mosque, which was broadcast live around the world on MTA International. 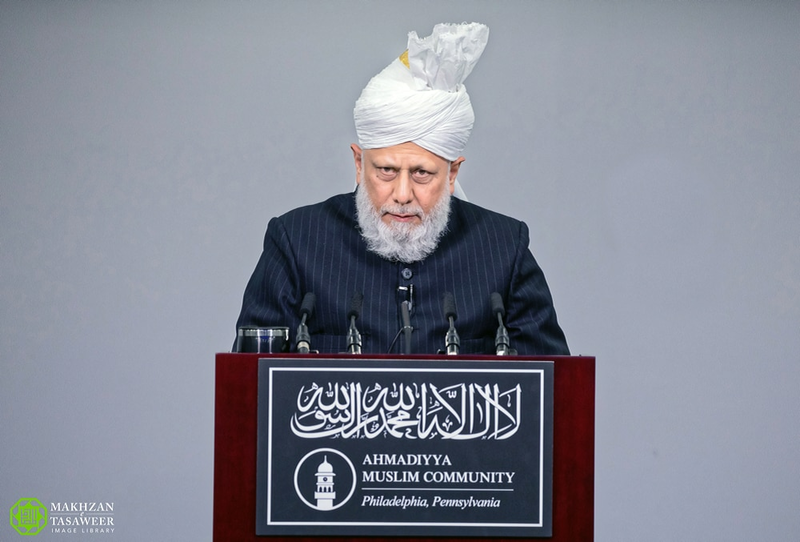 In his sermon, His Holiness reminded the worshipers that it is not enough to simply celebrate the opening of the new Mosque, rather it was incumbent upon Ahmadi Muslims to fulfil the true purposes of Mosques by joining together for the worship of Allah the Almighty and preaching the true peaceful teachings of Islam. His Holiness called on the worshipers to self reflect and analyse to see if they are fulfilling the rights owed to Mosques. His Holiness emphasised the importance of spreading the peaceful teachings of Islam and narrated that the Founder of the Ahmadiyya Muslim Community, the Promised Messiah (peace be upon him) had stated that wherever a person wishes to propagate Islam they should build a Mosque in that area. 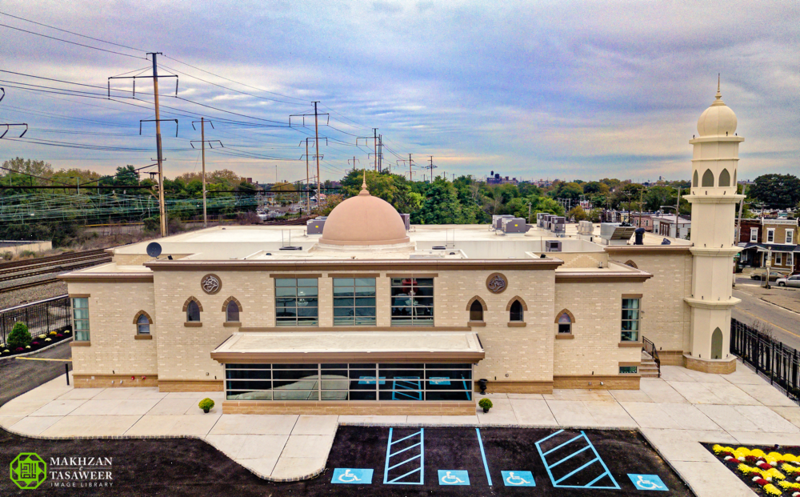 Hazrat Mirza Masroor Ahmad observed that despite a multitude of prayer centres established by different Islamic sects, the Baitul Aafiyat Mosque was the first purpose-built Mosque in Philadelphia. Thereafter, His Holiness mentioned that when the first Ahmadi Muslim missionary in the United States, Mufti Muhammad Sadiq came to America in 1920, he landed at the port of Philadelphia. He was denied entry into America for two months and was unjustly imprisoned. Whilst in captivity, he showed such high morality and righteousness that fifteen people accepted Islam through him. Later, over 5000 people accepted the teachings of the Ahmadiyya Muslim Community through him. His Holiness also narrated that the message of the Promised Messiah (peace be upon him) reached the United States in his own life through the Review of Religions magazine and that a person named Dr A. George Baker converted to Islam as a result of reading the teachings of the Promised Messiah (peace be upon him). His Holiness mentioned Dr. Baker was buried at cemetery near the new Mosque. The plot for the Mosque was purchased in 2007 and is based on a large four-acre piece of land. The complex hosts a Mosque with prayer halls for both men and women capable of accommodating about 700 people, a multi-purpose hall, a missionary’s residence, numerous offices, kitchen and large parking facilities with space for further development.